Polls showing a Liberal surge are going to help Trudeau‪‬, as anti-Harper voters get off the fence and hop on the bandwagon of the party they perceive as most likely to beat the Tories. Having said that, recent polls don’t reflect the Dan Gagnier resignation over the Energy East affair. 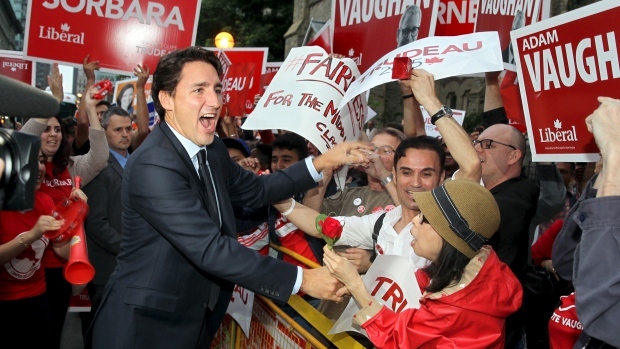 It remains to be seen whether this will put a damper on the Liberals’ results on Monday. Meanwhile, Mulcair continues to take a beating in the Quebec press on the niqab issue. The NDP can expect to lose seats in Quebec on Monday, and hasn’t really shown a strong gain elsewhere in the country. The Bloc may pick up a few more seats, but probably not enough to buoy it out of irrelevance. Elizabeth May will probably win her seat, and no others. The Liberal vote is more inefficient than the Tory vote based on riding distribution, and thanks to recent gerrymandering. We also probably haven’t seen the last of the Tories’ dirty tricks, as it’s likely they’re holding onto some cards to try to sway results on Monday. Realistic prediction: Liberals will win the popular vote, but Tories will win a narrow minority government. The government will be highly unstable with no opposition parties willing to prop it up but nobody wanting another election anytime soon. Chaos will ensue. Hopeful prediction: Liberal government, with strong NDP representation to hold the balance of power and force an informal coalition. Next post: Let’s do this, Canada!